Circulating Procon pumps such as CB-1610X series 103 stainless steel, Carbonator pumps CO-1504X ser 102 or 101, CO-1304X. Car wash, solar systems, R/O reverse osmosis systems, Procon osmonic pumps, welding circulation pumps, milling circulation Procon pumps, booster pumps, soft drink soda pumps, positive displacement Procon pumps, coffee machines, direct drive and shaft drive with 48Y frame motors or 56 frame motors. Series 101-102-103: 15, 25, 35, 50, 70, 80, 100, 115, 125, 140 US gal/hr. Series 104-105: 115, 140, 165, 190, 215, 240, 265, 330 US gal/hr. Series 106: 300, 360, 420, 480, 540, 600, 660 US gal/hr. Special O.E.M. application: series 10000 ex: 10043. We can rebuild your Procon pump within 24 Hrs. All our rebuilt pumps are done with 100% genuine Procon parts, plus all our rebuilt pumps have the same specifications as a brand new Procon pump. We had full factory training directly from Procon Pump's head office and manufacturing plant. We have a large inventory of NEW Procon Pumps, ready to be delivered. We ship all over the world with carrier companies such as Purolator, UPS, FedEx, Dicom, Loomis, etc. Our terms of payment are C.O.D. with your order. We accept Visa and MasterCard credit cards or you can pay with a bank wire transfer or draft, both in Canadian funds as well as US. 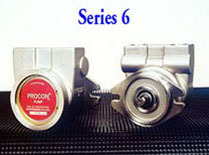 We have a large inventory of Procon genuine parts in stock to repair any model of Procon pumps. Also available in stock are accessories such as brackets, love joys, couplings, brass or nylon, large or standard, flow pro-view filters, strainers 100 mech, V-Band clamps in stainless steel. Such as: Special clearances, special seals like: Viton / Fluorocarbone, E.P. Ethylene propylene and Neoprene used in special applications. We also rebuild O.E.M. Procon pumps used by Haskris, Culligan, Perlick, Alco, Booth, Multiplex, Neslab, Cornelius, Coca-Cola, Pepsi-Cola, Molson, Labatt, Unibroue, Bellequele, Lancer, McCann and International Carbonic. Click on any of these pictures to learn more on GE's Marathon Motors.